The first written records of the estate are found in the register of the Vyšehrad priory of 1273. At that time it was a fort providing safe haven for local peasants from an armed attack. The Hussites lead by Jan Žižka of Trocnov took it in 1420 while rallying to the defence of Prague against Emperor Sigmunds army. 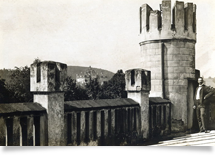 The premises then passed into the ownership of the city of Prague, frequently changing occupiers throughout the 16th century. This may have caused its considerable neglect and by 1620 it was reported as deserted and derelict. Following a period of serving as a spiritual retreat to the St. Havel Church in the Old City of Prague, and receiving further damage from religious wars between Catholics and Protestants, the estate was revived in 1627 by the Carmelite Knights Order who acquired it into their ownership by Emperor Ferdinand IIs decree of 27th April of that year. The entire premises of the St. Havel fort and settlement were one of two real estates granted to the Order, the other being a church in Vienna. The purpose of this gift was to provide the Knights with sufficient income to build a monastery attached to the St. Havel church. By then the Order had relaxed its strict rules and was allowed to own real estate. 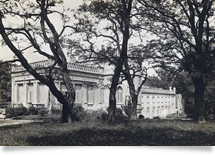 Their income from the estate, however, initially failed to provide adequate means and they were granted a ten-year permission to supplement their income by alms collection. A later improvement of their finances enabled the Carmelites to restore and enlarge their Krč estate and to establish their summer retreat here in impressive nature surroundings. A new chapel, built around that time, was dedicated to St. Havel and its religious services were open to the local population. The Carmelite Knights monastery, however, was abolished under Emperor Josef IIs reforms in 1786 and the estate was assigned to a religious fund from whom it was bought in 1795 by Jan Gever of Ehrenberg. New service buildings were added to the main one, such as stables, sties, a barn and other types of farmhouses. There was a mill, a stream and a pond. 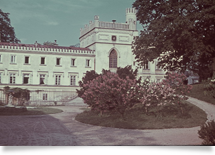 The entire estate with all its additional buildings retained the St. Havel name given to it by the Carmelite Order. 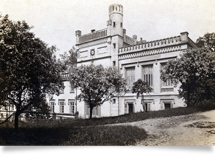 During the years 1840-1860 the estates new owner, Viennese lawyer Baron Schlosser, gave the main building its present shape, adding a new right wing with a hall. To open a full view of the Chateau the new owner demolished the right-hand side farmhouse which can still be seen in the 1840 ground plan. The park was enlarged and cultivated in the English style. 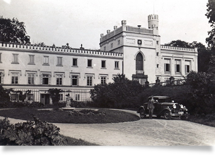 Tomas Welzl, an important Prague entrepreneur who was instrumental in the development of the Krč suburb, bought the Chateau on 24th July 1880. 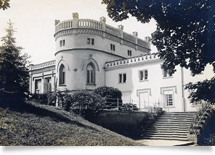 The 1900 photographs already show the fully renovated estate with its well tended garden terraces. The Chateaus courtyard was dominated by a fountain embellished with a sculptural composition of two angels holding and open umbrella. The Welzel family wisely rejected all offers to parcel the estate out for additional housing development. Following half a century of neglect, the Chateau has recently been successfully restructured and given a new lease of life as a luxury hotel. With its pond and park it offers a quiet respite from the metropolis hustle and bustle, yet being only 20 minutes away and easily accessed by public transport.